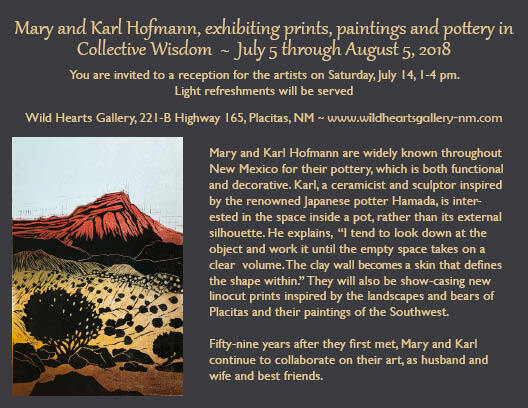 If you live in Placitas, or a nearby area, there’s a good chance that you frequently interact with the pottery of Karl and Mary Hofmann. Their work seems ubiquitous; I find myself drinking from one of their mugs or gazing at one of their plates—on display in the center of my dining room table—almost daily. Their work is both functional and decorative, but that’s not what makes it such a delight to use. It’s also quietly confident, as if it was never forcibly made, but rather exists as an organic entity in its own right. Karl is interested in the space inside a pot, rather than its external silhouette. He explains, “I tend to look down and inside the object and work it until the empty space takes on a clear volume. The clay wall becomes a skin that defines the empty space within.” His shapes are felt, rather than thought, and they’re the result of a sensitivity to the material and process that Karl has honed over the past half century as a ceramicist and sculptor. Over the past fifty years, Karl and Mary have worked together, both as husband and wife and prolific collaborators. They met on a blind date while attending graduate school at Michigan State University. Karl was obtaining a degree in history, and Mary, in painting. Mary recalls that the date turned out to be not so “blind,” as they “discovered they both had a passion for art.” After knowing each other for only six months, the pair married. While in the army, Karl had the good fortune to be stationed in Japan, where he visited the studio of renowned Japanese potter Hamada as well as the pottery village of Onda. The Japanese aesthetic and artistic philosophy proved foundational for Karl’s later career as a potter. After serving in the army, Karl pursued two of his passions—history and ceramics-sculpture—receiving a Masters degree in each and meeting Mary along the way. Karl went on to teach humanities and art at universities around the country, while Mary worked in the university libraries. They found themselves in Placitas in 1976, when the town was well on its way to becoming a thriving artistic community. Soon after, Mary began working at the UNM library, and Karl found himself teaching art at Sandia Prep, where he would remain for the next 19 years, all the while working feverishly on his craft. Mary’s extensive art education enabled her quickly to acquire pottery skills and, in an attempt to keep up the pottery production while Karl was teaching, she shifted her focus and embraced pottery full time. She makes most of the hand-built (as opposed to thrown) pieces, manages their business, completes much of the “slave labor” involved in the very long and intensive pottery process, and draws on her painting background to decorate fired pieces. In 2017 Karl attended several workshops on printing techniques and is now working on a series of lino cut prints inspired by the bears in Placitas. Karl and Mary were recently honored with the 2012 Albuquerque Art Business Association Local Treasures Award, which recognizes artists that are devoted both to giving back to the community and encouraging young talent to continue the legacy of New Mexico’s diverse culture.